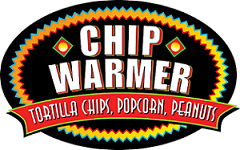 Chip warmers are used in restaurants everywhere to allow large batches of chips to be prepared ahead of time and kept fresh until service time- saving you time and giving guests a perfect product. They are also perfect for operations that want their product visible to increase impulse buys, such as convenience stores, concession stands and food courts. Chip Warmers provide foodservice operations with flexibility, enabling products to be either be prepared ahead of time or bought in bulk and heated as needed. 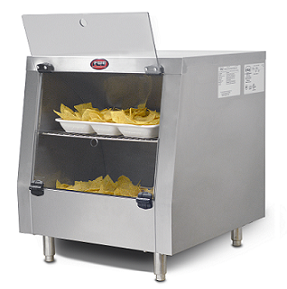 FWE's bulk chip warmer, the HMC-230, is specifically designed to warm not only large volumes of tortilla or nacho chips, but also for other bulk snack foods such as soft pretzels, pre-popped popcorn and peanuts-in-the-shell. This model is ideal for added storage and warming for high volume operations. Chip Warmers are equipped with a natural convection heat system. FWE's radiant heat system gently surrounds foods with a soft, uniform heat to radiate throughout the compartment to provide better appearance, taste, and longer holding life. Heat rises naturally and circulates from bottom to top without blowers. The HMC-230 comes with two Lexan doors. Depending on where the unit is placed, these doors can enable customers to see the products and decide they need to have them, or signal staff when supply is getting low and the unit needs to be refilled. A removable wire shelf inside the unit keeps pre-assembled supply ready-to-serve and provides added convenience for operators during peak operating times. The top door flips up with snap-lock hinges that stay open to free up operators hands. The bottom door flips down and snap-locks open for easy loading, serving and refilling. Both of these doors allow for easy product loading, making this unit perfect for either heating for short or prolonged periods of time, producing a consistent and better tasting product - without burning. This chip warmer's slim designed is great for countertop use. The 15 gallon capacity is the perfect size for smaller volume operations or volume feeders with constant replenishment, striking the perfect balance between meeting demand and reducing waste. The chip warmer's low profile design also makes it perfect for under counter use. The unit conveniently fits under 36" counters and can easily be stored when not in use. Operations can further streamline food handling by creating a mobile work station. 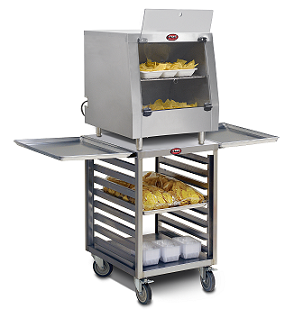 FWE chip warmers can be mounted to an OTR base, keeping trays close at hand and providing added storage. This helps in planning the serving sequence as well as improving productivity. OTR bases are sold separately; contact a sales representative to learn more. Units have easy-to use controls, simply use the master ON/OFF switch and use the mechanical controls to select your temperature setting anywhere from 90-190°F. No excessive training is needed to be able to operate. Sanitation is an important factor in any kitchen. This stainless steel cabinet easily wipes clean and features a removable clean-out crumb pan for speedy clean-up. FWE chip warmers are constructed of stainless steel, inside and out, providing maximum reliability and sanitation. The cabinet is fully insulated and has a cool to touch exterior, ensuring operators' safety while also keeping food hot. Graphic wrap options are available so your operation can use the chip warmer as a bill board! Catch the eye of your customer with your custom logo, message, or menu item images. FWE offers a variety of features and options for our chip warmer, to learn specifics, compare models, see literature, additional photos and get a quote, click here.